Vegas and the World's Oldest Profession- Practical Tips For Men Only: "As a single man who enjoys a good time, I've availed myself to the occasional pleasures of Women of the Night in Las Vegas. (Vegas hookers, in less subtle vernacular.) There are a lot of people out there who have no idea how one goes about buying the services of a prostitute. Whether they ever want to try it or not, inquiring minds want to know! So here it is... the ins and outs of prostitution in Las Vegas. Pun intended." Top 10 Tips for Beginning Card Counters: "Here are ten tips that I can offer fledgling card counters based on my experiences. If you follow my advice, your journey to become a winning player will be a lot easier." Order online: $15 for the e-book (read and print on your computer immediately after your purchase... nothing is shipped to you). Click here to order. Have you wondered whether you should play heads up, or play at a crowded table? Wonder no more as Fred Renzey explains the pros and cons of both for basic strategy players and also card counters (Note: If you are a card counter, there is some excellent advice on when to play more than one hand and when not to). Joe Pane provides the answers to this year's Blackjack Ball test, and describes the contest for the Blackjack Cup, including who the finalists were, and who won. Joe also has some eye-popping figures on how much a player stands to lose, and the casinos stand to win, at a 6-5 blackjack game. Alan Krigman explains the relation of blackjack bankroll on your chance of success, while Dan Pronovost revists Krigman's results from last month, namely, that using more aggressive strategies as a card counter to get your edge higher might actually mean less chance of winning in the short run. Yours truly gives on overview of the blackjack games in Laughlin Nevada, and Frank Scoblete does the same for Atlantic City. Don't miss reading Ken Smith's article on how you can use the dealer outcome probabilties to figure out the playing strategy on critical tournament hands. The Babe rants about the unfair treatment he and other tournament players received when a well publicized tournament was unexpectedly canceled. The kicker in poker is important, and Bill Burton explains how to consider your kicker when choosing your starting hands. Lastly, we have a summary of upcoming major blackjack tournaments courtesy of blackjacktournaments.com. Gaming Authors Meet & Greet: This Sunday, March 9, from 1:00 p.m. to 2:30 p.m., I'll be at the Palace Station Casino in Las Vegas, along with American Casino Guide author Steve Bourie, The Frugal Gambler author Jean Scott, and the Vegas Values author Scot Krause to meet gambling fans, and then participate in a 30-minute session of answering questions from audience members on a variety of gambling topics (the event will be held in the Sound Trax Lounge). Admission is FREE and serious gambling questions are welcome! If you are in town on March 9th, stop by and say hello. Reminder: We have copies of Jean Scott & Marissa Chien's new book, Tax Help for the Frugal Gambler in stock. The deadline for filing your US taxes is fast approaching; if you have gambling wins, this book will explain how to report them (and your losses) on your tax schedule. 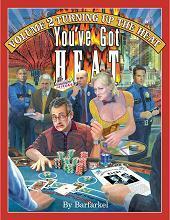 A must-have book for gamblers who want to minimize their chances of getting the dreaded audit letter from the IRS. We'd like to introduce our newest Blackjack Insider sponsor, Jackpot City Online Casino. Once you experience the online gaming that is JackpotCity.com, you'll realise that you've found a casino home!! Its line-up of over 300 action-packed casino games makes sure that the excitement of winning is tangible and the staggering 18 Progressive Jackpots ensure you can turn up the heat when you're in the winner's seat! Meanwhile, it's exciting and rewarding Table Games that include Blackjack and Roulette keep even the most skilled gambler enthralled. Its incredible payout percentage (97.4%) is subjected to monthly audits and its practice of "fair play at all times" is assured after adopting the Interactive Gaming Council's (IGC) code of conduct. Get 500 free play credits, or 100% deposit match up to $100, when you open a new account at Jackpot City Online Casino. E-mail subscribers can also read each month's issue online at our web site: BJI Issue #98, March 2008. P.S... Blackjack Insider Celebrates it's 100th Issue!! And to celebrate our upcoming May 100th issue, we're arranging for an amazing single-topic retrospective newsletter on advantage gambling by our favorite gaming experts. Click here to read the press release. And every article in the 100th issue will be be free to be read by all! More jackpots, great bonuses, 97.4% payout at Jackpot City Online Casino! Interactive Gaming Council Seal of Approval (IGC). "Nearly all blackjack players, novices and pros alike, seem to be sensitive to how many other players are at the table. Most novices hate to play alone because they tend to feel "overpowered" by the dealer. More customers at the table provide them with a feeling of "reinforcement." On the other hand, advantage players don't like full tables mostly because the game becomes just too slow to be profitable. So let's have a look at crowded vs. empty blackjack tables from both the recreational and professional points of view..."
"As promised in my article last month, the answers to this year's Blackjack Ball quiz are at the end of this article. Check the answers against yours to see how you would have done if you had been invited to this party that takes place in the secret world of advantage players..."
"Winning in a repetitive bet milieu like a casino game, often requires a big enough bankroll to weather the cold streaks. It's a matter of probabilities, not absolutes. The question isn't what multiple of your average bet is needed to play a certain game. Rather, how big a bankroll will yield some percentage confidence of surviving the normal downswings of the game with a given betting strategy..."
"Last month, BJI author Alan Krigman provided an excellent study of risk of ruin when counting cards. His surprising and counterintuitive conclusion was that using more aggressive strategies as a card counter to get your edge higher might actually mean less chance of winning, depending on your bankroll (i.e., you may have more losing sessions than winning sessions). I took a different line of attack on the problem, but Alan and I effectively leveraged the same principle: your bankroll as a card-counter must be matched to your betting strategy and risk of ruin..."
"This report on blackjack playing conditions is based on my one-time visit to Laughlin plus feedback I received from several advantage players who sometimes play in Laughlin (but mostly Vegas and Reno) and wish to remain anonymous. Rather than review every casino, I've instead focused on the kinds of blackjack games you will be find in Laughlin..."
"Ploppies in their own words: "Under every dealer up card is a ten and that is why you hit or stand." "I never split my doubles because that just doubles your losses. The splitting is a trick by the casinos. They are very clever." "How stupid it is to double over when you have a 11 against a dealer's ten? You gotta loose that one am I right?"..." "Unless you bust, your fate at the end of each hand comes down to what the dealer does. More importantly for tournament players is the fact that the dealer outcome affects every player at the table simultaneously. There is no more fundamental tenet to the principles of tournament play than the similarity of outcomes dictated by the common dealer. Understanding the dealer's likelihood of making various totals can be quite helpful to the student of tournament strategies..."
"Maybe you are old enough to remember the days when casinos actually treated you with genuine good will on those rare occasions when you won a few thousand dollars. Many even offered you a free room or a meal to celebrate your luck. No more! Now, you can throw cash at them for days or months, but don't you dare get lucky and finally win something. That is when they step in and give you the bum's rush, or cut your comps and leave you feeling like Rodney Dangerfield. You have probably already noticed this trend so you are probably wondering, "What's new now?" Stay tuned and I'll tell you..."
"There are many times when the winning pot is determined by a kicker, however some players don't think about their kicker until they lose their hand. This is why you should always consider your kicker when choosing your starting hands..."
Check out the schedule of major blackjack tournaments in March and Aprul by region in our Blackjack Tournament Report.